This week the former Apple and Target darling, Ronald B. Johnson, was shown the door by J.C. Penney’s board of directors. After 17 months of attempting to remake the Penney’s brand, Johnson failed, at least in the near term, as sales and cash flow plummeted amid his reinvention of the business model. 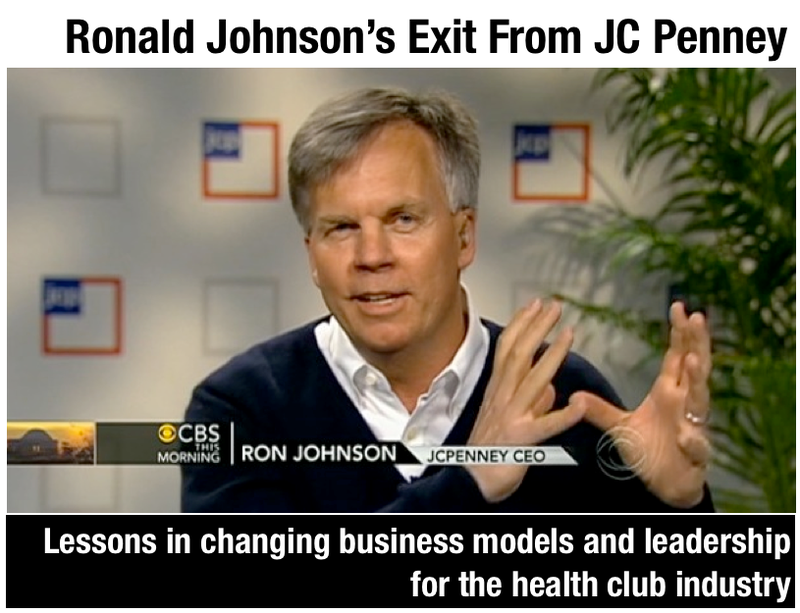 Johnson’s story and Penney’s plight provide great lessons on the challenges facing businesses and industries in today’s atmosphere of uncertainty. Consumer habits are evolving so much and the buying experience is undergoing a revolution that cuts across retail, health clubs and everything else. Don’t believe me ? Check out accenture’s recent retail research and this Forbes article as evidence . You see the bricks and mortar fitness industry is changing just as dramatically as retail and other industries are and established players are all going to have to wrangle with the issue of how they will remain relevant or die. Some felt Ron’s arrogance would result in his demise; but what should one expect from a guy who was a Steve Job’s protage and engineer behind Apple’s retail rise with a stellar track record at Target to boot ? In fact that is why he was chosen. An article by Stephanie Clifford, Chief’s Silicon Valley Stardom Quickly Clashed at J.C. Penney, depicts Johnson’s attempt to transform the retailer. However, Clifford’s story fails to put some important parts in context. J.C. Penney, though profitable, was seen as a poor performer that was losing ground to competitors like Macy’s on the high end and Kohl’s on the value end. (Yes Chuck Runyon its the bifurcation dynamic again :)). Its a similar situation several major health club chains face, as they are being picked apart by low price competitors and high end Equinox along with other niche micro gyms and studio concepts. Its easy for anyone to play Monday morning quarterback with Johnson’s strategies; but he was hand selected by the board exactly for being a change agent and innovator because the board saw an emerging problem. Did Penney's bold efforts fail more because of the way they were executed or how they were timed? I'm not sure, but consider that the tablet revolution started with the failed Newton, 10 years ahead of the iPad. All retail competitors are facing the same challenges as Penney’s and while Ron failed, it sure is interesting how many people were curious about his strategies. An excerpt from Clifford’s article shares this: “Ken Murphy, senior vice president at Standard Life Investments, said that “many retailers, while openly cautious and dismissive of the JCP experiment, were actually nervously watching JCP’s plans unfold with some concern that if their strategy worked, the industry would be required to adapt faster than expected to a new trend in retailing.” You see because Macy’s, Kohl’s and others may be winning a battle with Penney’s, they might still lose the war to digital competition and a chameleon consumer whom they are desperately trying to figure out. This is the tight rope that the revolutionary Johnson walked and its the same one faced by many leaders in the health club industry today. The same pressures that face Penney’s business model are impacting a number of significant health club brands today. Fitness First, formerly the world's largest club chain, failed last year. 24 Hour Fitness saw the majority of its senior leadership let go recently. These events and many others only evidence the high stakes game that is being played out across the health club industry, as it is with most consumer industries. Leaders know things have got to change but its hard to know just how. Sometimes they succeed and often they fail. I’d theorize that leadership changes won’t be exclusive to 24 Hour or Fitness First . In the coming months more changes, consolidations and new entrants will emerge because in this day and age no industry or leader is immune from digital darwinism. Just ask Ron Johnson and J.C. Penney’s shareholders. So what do you think ? How do you see the health club industry going through change like retail and other industries? Do you see changes in leadership in some health club brands ? Please let me know. I want to hear from you !! Thanks for reading.